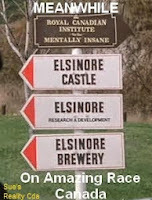 Sue's Reality Canada: BBCan3 Episodes 12 & 13 Week 5 HOH, Noms, PoV + 1st Five Comp: "Everything's So Screwy Around Here"
BBCan3 Episodes 12 & 13 Week 5 HOH, Noms, PoV + 1st Five Comp: "Everything's So Screwy Around Here"
You could say this whole week has been a monumental screw up. Zach's win is celebrated by both JP & Bobby...awkward. The HoH comp continues. It's the old "Before and After" trivia quiz. The most important thing to realize is that Newport's plan this week was for JP to win this one, while Zach will win next week. This simple plan will prove to be the root of all evil. You guessed it. Jordan gets an answer wrong and is knocked out of the comp. It is now up to Zach, and it comes down to a tie-breaker between him, Godfrey and Pilar. 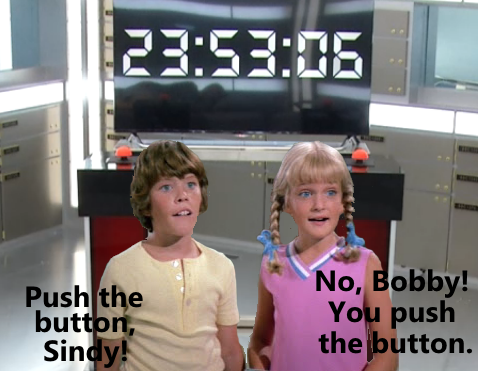 The question: How long, in minutes, did the Switching Gears comp last? Zach wins it. But then it wasn't that difficult when Pilar guesses 2600 minutes. Jordan feels bad...he assumes Zach thinks he intentionally threw the comp. Then he ran and jumped on Zach when he won. Gee, gosh. How can JP make it up to him? He gets a brilliant idea. Volunteer to go up on the block. And you know what's even better? Zach agreeing to it. Seriously, I am starting to think Zach has taken one too many shots to the head playing football. Newport's plan is to nominate Godfrey and Jordan, Jordan or Zach to win PoV, then backdoor Bobby or Bruno. Meanwhile, the First Five comp to determine who will re-enter the house gets underway. It's called "On the Edge" and it's a straightforward endurance comp. They must hold onto a raised rope with three knots (decreasing in size) used as foot support. Yes, this comp favours smaller body types. 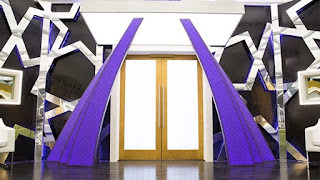 Inside, the HGs are given a short glimpse of the activity on stage, and they immediately get together to pledge bouncing out whomever makes it back in. (don't believe it, folks). The first to fall was Johnny, followed by Graig, then Risha - all 3 falling while on the first and largest knot. It's now a fight between Naeha and Sindy. They adjust to the second, medium sized knot. Sindy says her pageant training taught her to never show pain on her face. That's fine, but I don't think pageant training taught her how to hide the buckets of sweat dripping off her face. When they are told to re-adjust down to the final and smallest knot, Naeha can't get her feet to grab it. She's done. Sindy cries. Arisa tells Sindy to make her way into the house quietly, and go to the vault where she will be given further instructions. Oh oh. Someone let the S out. She is offered a chance to win immunity by correctly solving a series of 5 riddles, each resulting in 1 number of a five digit code. She had only 30 minutes to do it, or else she would have to spend the night in the Vault. Needless to say, she won immunity. While this was going on, the PoV comp started. It was a very long, very hectic day. 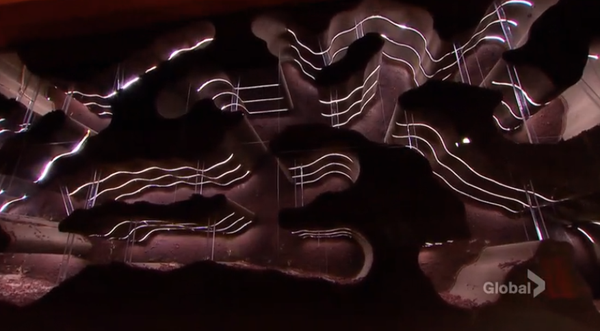 Trevor Boris really outdid himself with this week's PoV comp - a massive, vertical maze called Ant Farm. This was also the challenge that the 3 winning fans got a chance to participate in. Zach, Godfrey, JP, Ashleigh, Sarah and Pilar. They must each retrieve 6 food items ( marked on disks) hidden in the maze, and are timed individually, without knowledge of each others' results. Ashleigh does the worst at 42 min, while JP - clearly with a height advantage, wins it at just over 4 minutes. And then there is JP. Poor, misguided, all-too-trusting JP. He decides to throw the comp. Soooo, you know where this is going, don't you? Don't you? Yep. Zach decides to keep the nominations the same. I would leave it at that, but then I would leave out THE best moment of the week. 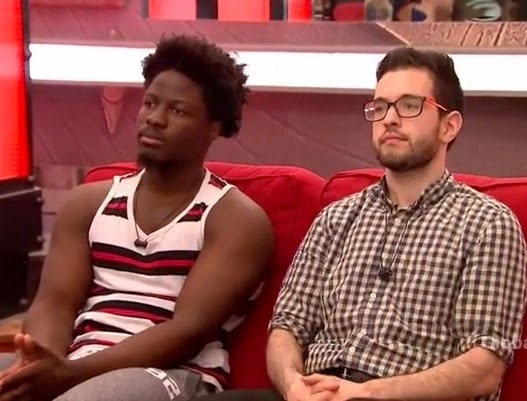 Perhaps THE best PoV Ceremony reaction in Big Brother Canada history. And it comes from Godfrey who proclaims that Zach just awakened a sleeping giant. Godfrey looks right at Zach and says he is not afraid to get blood on his hands. Oh Oh. Zach, you are so screwed. Here is my spoiler: There is too much screwing going on. Zach spends all his time this week trying to get screwed by Ashleigh in the HoH. Jordan takes a double hit: first he screws himself, then Zach screws him. Meanwhile, Zach doesn't even see he's getting screwed by his other alliances. There are way too many HGs still left in the house. We have already had one double eviction week, which evened out the cast & schedule to be on par with S2. To continue keeping the numbers and events even with S2, we would need 2 more double evictions - one in week 6 (next week) and another in week 8. However...that was before Sindy came back. People are getting screwed all over the house.